St. Donatus, Bishop and Martyr who suffered martyrdom under Emperor Julian the Apostate, in 361. This Bishop of Arezzo in Tuscany was illustrious for his sanctity and for his gift of working miracles. The Church has always remembered him with the highest veneration. This Saint came with his family to the West, from Nicodemia in the East. He was educated by the priest Pigmenius. As a child he had as a classmate Julian (the later emperor Julian the Apostate). Indeed, on Feb. 4, 362, Julian issued an edict ostensibly of religious equality, but which benefitted paganism at the expense of Christian faith. St. Donatus, his family, and his teacher Pigmenius would all perish in the persecution which followed. Having been made bishop at Arezzo, St. Donatus preached and wrought miracles. He resurrected from the dead a woman named Euphrosina. He defeated a dragon who had ruined a local well. The blind woman Syriana received her sight through his prayer. Asterius, son of the prefect of Arezzo, was afflicted by a demon, but St. Donatus drove out the devil and set Asterius free. Once pagans attacked the church where the Saint was celebrating the Holy Liturgy. They shattered the chalice which was used, but the Saint, after intense prayer, collected the pieces together. None of the Lord’s Blood spilled. Amazed, seventy-nine pagans converted to the Christian faith. A month after this miracle, Quadratian the prefect of Arezzo arrested a monk named Hilarian and the bishop Donatus. 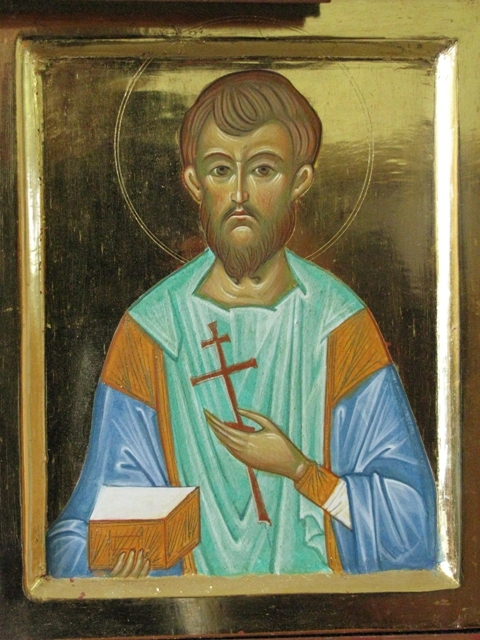 St. Hilarian was martyred in 362 on July 16. St. Donatus was beheaded upon Aug. 7. Lesson from the letter of St James the Apostle. Dearly beloved: Esteem it all joy, when you fall into various trials, knowing that the trying of your faith begets patience. And let patience have its perfect work, that you may be perfect and entire, lacking nothing. But if any of you is wanting in wisdom, let him ask it of God, Who gives abundantly to all men, and does not reproach; and it will be given to him. But let him ask with faith, without hesitation. For he who hesitates is like a wave of the sea, driven and carried about by the wind. Therefore, let not such a one think that he will receive anything from the Lord, being a double-minded man, unstable in all his ways. But let the brother of lowly condition glory in his high estate, and the rich man in his low condition; for he will pass away like the flower of the grass. For the sun rises with a burning heat and parches the grass, and its flower fails and the beauty of its appearance perishes. So too will the rich man wither in his ways. Blessed is the man who endures temptation; for when he has been tried, he will receive the crown of life which God has promised to those who love Him. Grant, we beseech You, O Lord, through the intercession of Your holy Martyr and Bishop, Donatus, whom we honor with gifts consecrated to the praise of Your name, that the fruit of devout prayer may increase in us. Through Jesus Christ, thy Son our Lord, Who liveth and reigneth with thee, in the unity of the Holy Ghost, ever one God, world without end. R. Amen. The faithful and prudent servant, whom the master will set over his household, to give them their ration of grain in due time. Almighty and merciful God, Who make us both the partakers and the ministers of Your sacraments, grant, we beseech You, that by the intercession of St. Donatus, Your Martyr and Bishop, we may progress in our fellowship with him by faith and worthy service. Through Jesus Christ, thy Son our Lord, Who liveth and reigneth with thee, in the unity of the Holy Ghost, ever one God, world without end. R. Amen.